SACRAMENTO REGION, CA (MPG) - Parents are urged to help educate their children of the dangers they may face on the streets. 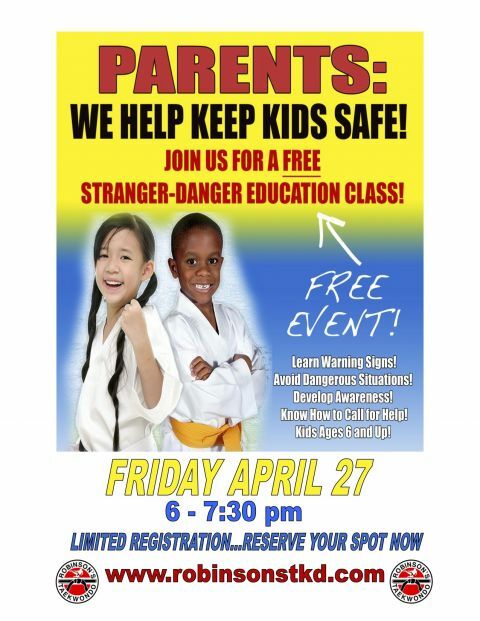 Black Belt instructors at Robinson’s Taekwondo will help families learn stranger danger warning signs, how to avoid unsafe situations, raise awareness and how to call for help effectively. This is a free community service safety event offered by Robinson’s Taekwondo. Since 1975 Robinson’s has taught thousands of students self-defense in the Sacramento region. Serving the needs of the community and making the world safer is part of the credo to be Black Belt martial artists. The free class is on Friday, April 27 from 6pm-7:30pm at regional Robinson’s Taekwondo locations. Space is limited to parents are invited to register at www.robinsontkd.com. Click on event registration.